Read our full low-down on climbing Mount Kenya, the routes, the weather and the practicalities of this stunning mountain. Mount Kenya is the second highest mountain in Africa. Long overshadowed by Kilimanjaro, trekkers are starting to take notice of this beautiful glacial peak. An ancient dormant volcano, its flanks have been shaped and moulded to dramatic affect by glaciation. Mount Kenya plays host to dense bamboo and rainforest on its lower slopes and rare Afro-Alpine moorland and plant-life at higher elevations. Alongside the climbers’ twin peaks of Batian (5199m) and Nelion (5,188m) lies the no less dramatic trekkers peak at Lenana (4,985m). The trek up Mount Kenya demands a degree of fitness and altitude smarts, but it rewards all the way to the peak. Hacking through dense forestation, with evidence of elephant and buffalo all round. Marvelling as the forestation clears to reveal rolling moorlands reminiscent of the Scottish Highlands. Emerging on Point Lenanna just as the red sun rises over the African plains below. There are 5 main routes to the peak. Sirimon: Sirimon route, is the most popular ascent as the altitude gain is nice and steady and it offers one of the most beautiful approaches to the peaks. Allow a minimum of 2 nights to peak when ascending, although we recommend spending an extra night at the last camp (Shipton’s) on the way up. Naro Moru: Naro-Moru is the most popular descent route, fast and easy (at least on the way down!). Naro Moru passes through the notorious vertical bog section which gets very waterlogged in the rainy seasons. The vegetation is at it’s most striking on this route. It can be descended in one very long day, usually done in two days and one night. Chogoria: If you have more time then choose dramatic Chogoria over Naro Moru for the descent. The Chogoria route passes by tarns, waterfalls and an incredible gorge. Allow two or three days for your descent. Timau: Timau is little used nowadays, there is little forest on this side of the mountain and no facilities, just lots of wide open country. 5 Day Sirimon Naromoru Mount Kenya Trek: Our shortest Mount Kenya trek ascends via the easiest (and arguably most picturesque) Sirimon route and then down via the quickest Naro Moru route. This is our most popular trek on the mountain and includes an extra days acclimatisation at Shipton's Camp to get round any altitude issues. 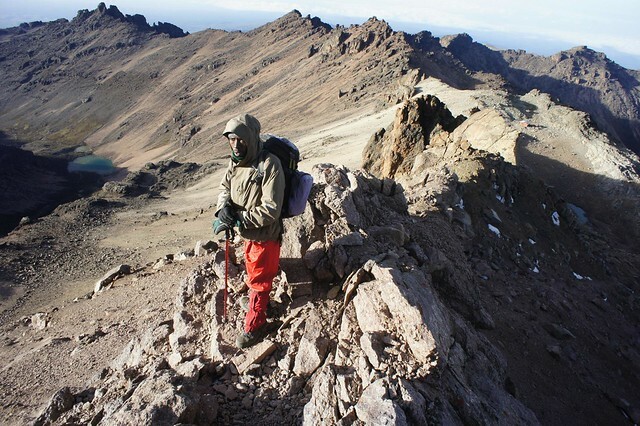 7 Day Sirimon Chogoria Mount Kenya Trek: The classic choice for those with more time. Up the beautiful (and nicely paced) Sirimon route then down arguably the most dramatic Chogoria route past gorges, tarns and waterfalls. Includes an extra days acclimatisation at Shipton's Camp to get round any altitude issues. 7 Day Burguret Chogoria Mount Kenya Trek: The wildest most remote route involves climbing up the little uses Burguret route. The path is barely a game trail in places, the going is tough under foot but the rewards of solitude and wilderness camping are hard to beat. This is definitely one for the more intrepid trekkers. Mount Kenya and Masai Mara Safari combination: A popular 11 day itinerary that combines the 5 day Mount Kenya trek with an eco safari through the Rift Valley Lakes and Masai Mara Reserve. Available as regular scheduled small group departures or private guided tours. The Weather and When to Go? First things first, although Mount Kenya is on the equator, at an altitude of 4,000m it gets freezing at night! You need to be prepared for overnight temperatures well below freezing (a good three/four season sleeping bag is a must). Minus 10 or even minus 20 degrees C are not unheard of at Point Lenana. Otherwise expect plenty of hot overhead sun and rain if you are trekking during the short or long rains. From Nairobi, Mount Kenya is around a 4 hours drive. There are good paved roads all the way to the towns at the foot of the mountain, but the last stretch of road up to the park gates is a rough dirt road that can get almost impassable in the rainy season, when a 4wd is essential. Trekking Mount Kenya: Independent or Guided? 1.Do it independently. Only to be attempted by experienced trekkers with extensive high altitude experience. Each year trekkers die on Mount Kenya attempting Point Lenana, it is easy to get lost in the cloud cover! If you do want to attempt the trek independently you’ll need to get yourself to the park gates by mutatu and taxis. The park authorities do not allow trekkers to enter the park alone, so there will need to be two of you. You’ll need to be prepared to bring all your own gear and provisions. The biggest challenge you will find is navigation on the mountain. Paths are not clearly marked and cloud cover is common. If you don’t want to lug camping equipment, then there are huts all the way on the Sirimon route. If you do choose to do it on your own, don't expect to be popular with the locals, as it deprives them of work. 2.Organise your trek from Nanyuki. If you can get yourself to Nanyuki or Naro Moru you will be able to shop around and find guides and porters locally. This is a good way to keep costs down, but allow a couple of days to pull everything together. 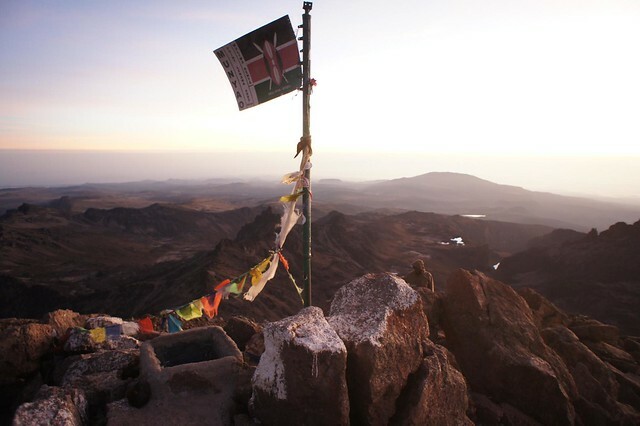 Try the Mount Kenya Guides and Porters Club (http://www.mtkenyaguides.com). A good guide should be able to help you source porters, a cook and food and make any necessary bookings at the huts. The Kenya Wildlife Service keeps raising the prices for park entry (to the extent that most websites offering Mount Kenya treks are displaying out of date prices). Currently the entrance costs are $150 per adult for a three day package, $220 per adult for four days or $300 per adult for 5 days. This covers the entrance fee plus camping fees. So for a typical 5 day Sirimon Naro-moru route Nairobi, you’ll need to pay for 4 days in the park at $220 per person. Check http://www.kws.org/ for up to date pricing. You’d be mad to come to Kenya to climb Mount Kenya and not explore at least a little of this magnificent country. Most people will want to combine the trek with a safari. The nearest parks to Mount Kenya are the Northern parks of Meru and Samburu. Both are fantastic parks with arid scenery reminiscent of the Lion King. 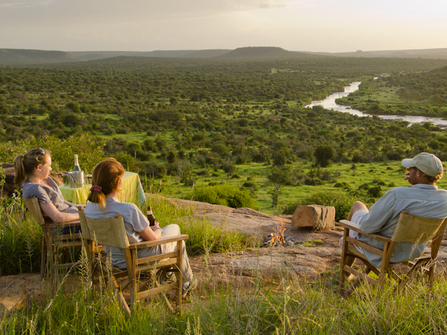 There are mid range camping options as well as the usual luxury safari lodges on offer. You can get to Samburu in a couple of hours from Mount Kenya, and if you are short of time three days is sufficient to get a good taster of Samburu and then get back to Nairobi for your flight home. If you have more time then you can journey by road from Mount Kenya to Masai Mara via the Rift Valley Lakes. Allow around 6 days for this extension. (back to top).